The Advance Decline Line is a cumulative indicator that is calculated by subtracting the number of declining stocks for the day from the number of advancing stocks for the day. Each day’s calculation is added or subtracted from the previous day’s indicator value. 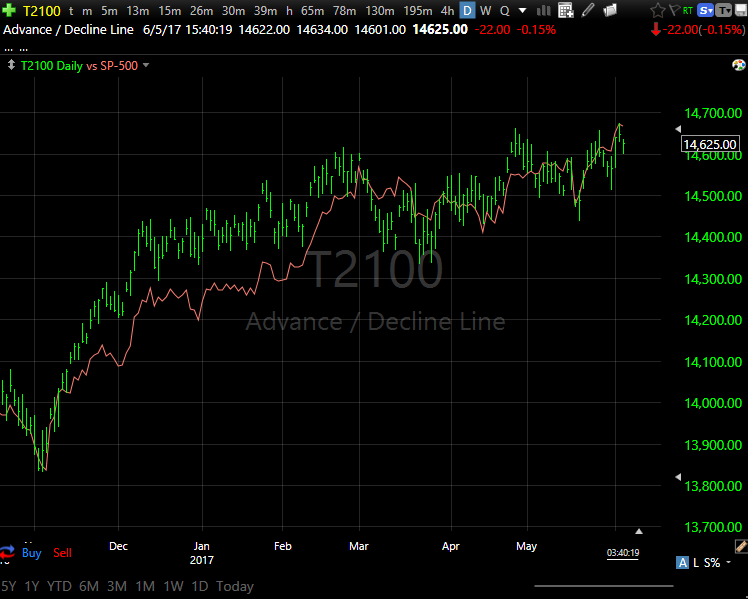 The Advance/Decline Line from Worden, T2100, represents a great improvement over the common one. T2100 is calculated only from NYSE common stocks and based off of percentages. It is calculated from the percentage of advancing stocks minus the percentage of declining stocks, rather than using raw numbers. For example, if 55% of stocks on the NYSE were up today and 30% of stocks on the NYSE were down, the net change today would be 25 (55% - 30%). When the Advance/Decline line rises in lock step with a broad average, such as the SP-500, it is an indication that a majority of stocks are in agreement with the strength shown by average. This is called "strong breadth." When the Advance/Decline line and the broad average decline together, breadth is weak. When these two lines disagree, it is called a divergence, and the Advance/Decline line is more apt to be correct, although it is by no means a certainty.